[build] Dripelectronics.com LA2A pcb v3 (atoms) build thread. Re: drip la2a pcb ver3 (atoms) build thread. Well how does the ver3 atom SOUND and stack up to the previous versions? Not a good sign seeing the thread just kind of drop out! I have 2 Drip LA2A's a version 2 that I brought from someone on here and a version 3 I built myself. I am getting a little more distortion with the version 2 than the version 3 when pushed hard. The version 2 is great on bass and electric guitars but is a bit much for vocals which the version 3 excells at as well as acoustic instruments. They both appear to be calibrated the same and work the same. I do not know if this is a difference with the versions or if it's the tubes, components etc I haven't been able to find a 'fault' with the version 2. Whether it be intended or accidental I really like the fact that they are different! Drip I just noticed on your manual the Opto 3 DC version. When will that be out? I would like to know if there are any sonic differences between the current Atom version and this DC version. Why have you made a DC version, is there any particular reason? Is it more technical or more sound reasons? I would like an DIY La2a that sounds like the real La2a, is this possible? There's really not much reviews here or online of your Drips La2a from a sonic perspective like they have at audio forums and audio recording reviews for audio equipment. If I am mistaken, can someone give me links to posts or online reviews of the Drips models reviewed. Most posts that I have read have based their opinions on the La2a DIY clones without hearing a real La2a. Also the T4B cell that UA uses comes in two sizes. I have read that the short and long versions are internally the same. The question I would like to know, did you design the Drips card with the long T4B cell in mind that will fit in the La2a Purusha case? I am thinking of maybe getting the long version, but I am unsure as to whether it will fit in the Purusha case, incase the Drips card was build around a shorter T4b cell. I had a look at your T4B cell but it does not state what height it is. I've rolled a Few tubes in my ver3, and the change can be striking. Yes get the UTC iron. What tubes did you change and what brands to and what were the results? Do you have more of a description from a Sound perspective. Striking is a little vague? How do you compare it to an Original or Re-issue La2a? 12Ax7A- I'm using RCA's gray plates. Black plates would be nice here too. 12BH7A- This is where I hear the most difference, I've rolled Amperex and RCA. RCA is a little dark, the Amperex is a little more open at the top end. You can go nuts trying figure out what is the best tube, there is no such thing. Just get strong NOS tubes and you'll be happy- trust me. You can always roll tubes in and out later. 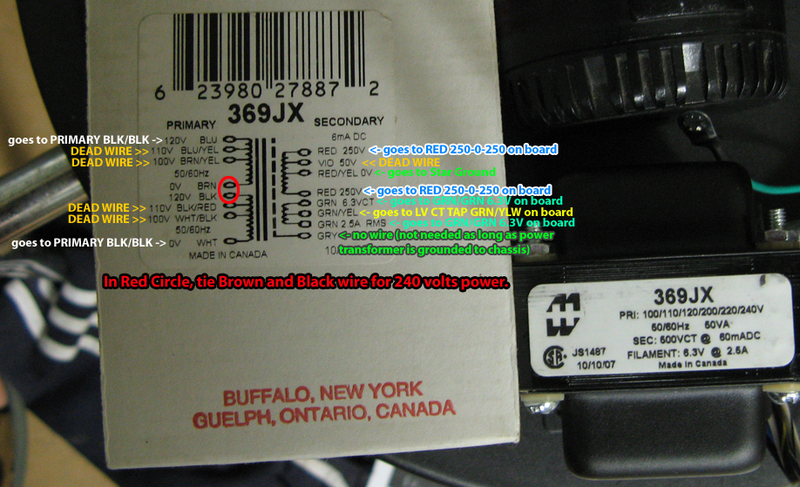 Is this the correct power wiring for 240 volts mains power using a Hammond 369JX Power Transformer? I just fired mine up yesterday, I'm not absolutely positive about how to wire the primaries for 240v... but seems like you have it all sorted out. Where can I connect the lamp on the front panel to power? Just confirm with him the voltage you are using for the lamp. There is a procedure to calibrate the meter? HI, I have a question about the meter backlight options... 'Cause I havent found a 6V fuse type lamp for the hairball meter, I'm going to use 2 yellow leds in series. I know this is easy for experienced people in electronics, but, I'm not sure how to avoid the strobo-effect on the leds if I put only a resistor between the 6,3V pad(pcb) and leds? 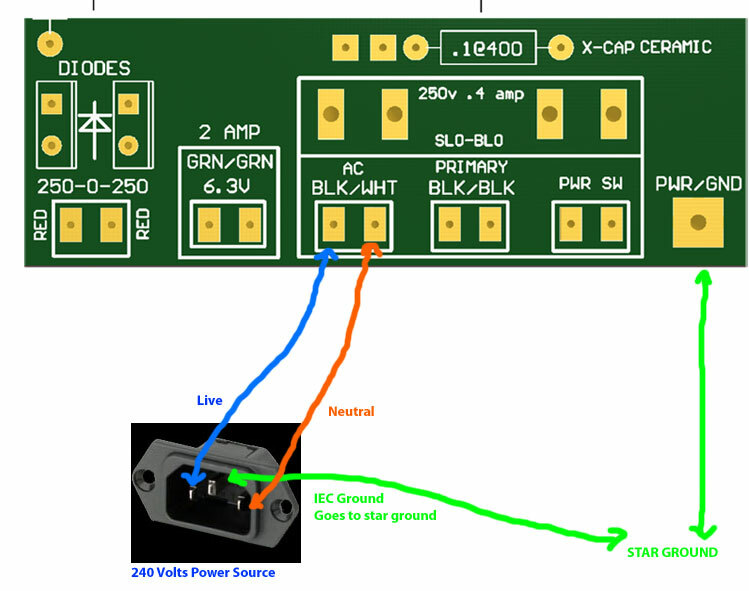 Do I need diodes to rectify the 6V AC and what would be the simplest way to do it ? A simple wiring diagram would help, PLEASE? I would greatly appreciate your information !! !